Incorporate QR Codes into your displays & signs! QR Codes allow you to easily serve a variety of information to potential clients with a simple scan from their mobile-phone! 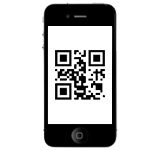 Invented in Japan by the Toyota subsidiary Denso Wave in 1994 to track vehicles during the manufacturing process, the QR Code (“Quick Response Code”) is one of the most popular types of two-dimensional barcodes. It was designed to allow its contents to be decoded at high speed. Although initialy designed for vehicle-tracking, QR Codes have in recent years become common in consumer advertising and packaging, because the popularity of smartphones “has put a barcode reader in everyone’s pocket”. As a result, the QR Code has become a focus of advertising strategy, since it provides quick and effortless access to the brand’s website & much more besides. Generate your own QR Codes courtesy of any of the free online code-generators and deliver them to us by email for inclusion in your signage and displays. Alternatively you can send us the information required to be added to your QR Code display and our design department will generate test & include your required information QR Code into your signage, in-house.